This is a book I really wanted to like and yet couldn't bring myself to do so. The premise was interesting and I loved the idea of a story set in Hungary as I am very interested in Eastern Europe. And, truth be told, there was nothing actually 'wrong' with this book. The writing was easy to read and the prose good. The characters were well drawn and interacted believable. But I just didn't fall in love with it; it never captured my imagination. I really felt I was reading on autopilot with no connection to the story or characters. I really don't think that was a problem with the writing/book though; rather, it was just a book that didn't suit me personally. Given that, I gave it three stars. It wasn't for me, but it is still a book others might enjoy. I hope I like this story a lot better than you did, fingers crossed :) I'm sorry that it wasn't anything special for you. I ordered the UK copy of the book as soon as I discovered it. 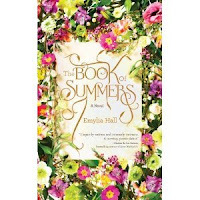 The cover is so, so pretty so The Book of Summers for now it is just decoration but hopefully I'll get too it soon enough.